Yesterday, four of our graduating seniors were honored during the University Scholars chapel. Congratulations to James Churchill, Alyssa Johnson, Kirby Lemon, and Lauren Shrader on the recognition of all their hard work over the years! Pictured below are the recipients and their nominating faculty. 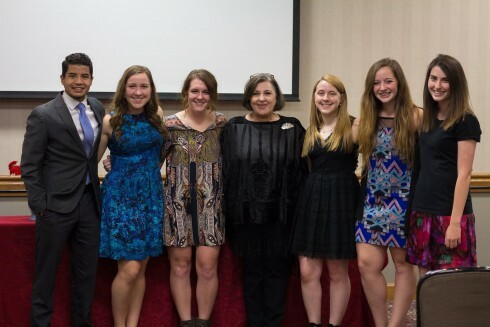 On Thursday, April 7, Sigma Delta Pi had a night of celebration for the presentation of the new volume of Hispaniola and to induct 12 new members. 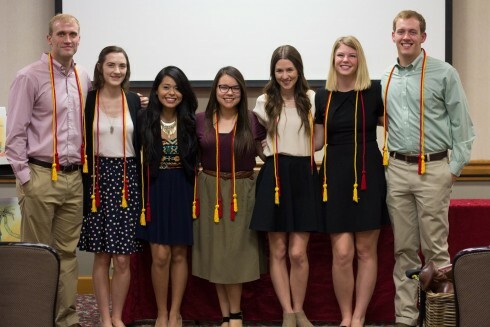 Current senior members were also given their graduation cords and many well-wishes for the future. The speaker for the night was Dr. Doug Foster, and other department directors showed their support for SDP as well, including Dr. Gary Green, Dr. Ron Morgan, and Dr. Pat Hernandez. Pictured below are some of the new SDP members. Felicitaciones! Congratulations to them all on their great achievement. Two students who produced work in creative writing classes taught by Al Haley have each won first place in the annual Texas Association of Creative Writing Teachers student writing contest. In this contest members are allowed to nominate one undergraduate and one graduate work in each of the three major literary genres. 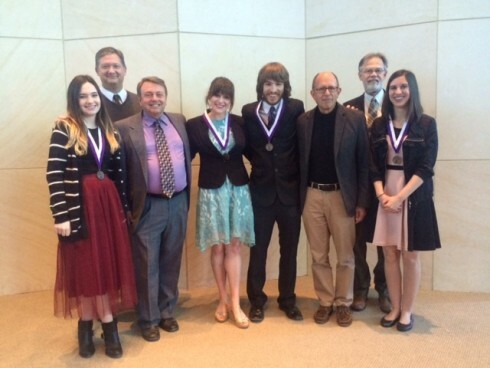 Al Haley is the ACU member of TACWT who nominated these students. The honor includes a $100 prize and an invitation to read at the annual TACWT meeting held in September. Alikay graduated in May. She is headed to New York City where she has a job at a Christian publishing house. Her short story was a witty, satirical take on a dystopian high school in which it’s not clear, until the end, if this is just a somewhat eccentric school or a mental institution. “All That’s Left to Do Is Fall” ponders some of the recent knowledge obtained about the origin of the cosmos and how this could affect one’s sense of who they are in day-to-day life. Stephanie graduated in December 2014. She was accepted into the Professional Science Masters in Biotechnology at the University of San Francisco. A notable feature of her poetry was how she integrated her knowledge of science into the poems.